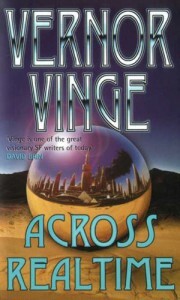 Across Realtime is really two books, The Peace War and Marooned in Realtime. There is very little connection between the two books and they could easily have been (and originally were) published in separate volumes. So at a total of 530 pages, what you get is actually two books for the price of one (okay, my copy was about 30% more expensive then a normal paperback, but it’s still an okay deal). The Peace War takes place around 2049 – fifty years after the War of Plagues, which was won by the Peace Authority, when they invented Bobbles. Now Bobbles are so important to both these stories that I have to try to make a short explanation of them, even if it’s kind of impossible without spoiling them. So, a Bobble is an energy sphere that once created will reflect everything (except gravity), so if you bobble a nuclear missile just as it explodes – well, problem solved. And as Bobbles last forever, well, they do last forever, right? Well, maybe not. Old man Paul and his young apprentice Wili are fighting against the Peace Authority, who has been keeping the peace for the last 50 years, through its monopoly on technology and especially bobble technology. Marooned in Realtime takes place fifty thousand years in the future. After the Peace War humanity went back to unchecked technological progress. About two hundred years later the human race disappeared from the face of the earth. The only people left are people who (through bobble technology) have traveled to the future. Brierson was a cop in the 22th century until a “customer” bobbled him to the future to escape capture. Now Brierson has to solve the murder of the only person who might have stood a chance at uniting the few remaining humans and create a fresh start. And if he can figure out what happened to the rest of humanity along the way – so much the better. Both of these stories are amazingly imaginative. The idea of the Bobbles carries a lot of The Peace War, but there is so much more, and the way they move on to Marooned in Realtime, becoming just another bit in the machinery of the future (okay, quite a large bit), makes me tingle with joy. Both of these stories received a Hugo Awards and seldom has a Hugo been so well deserved. 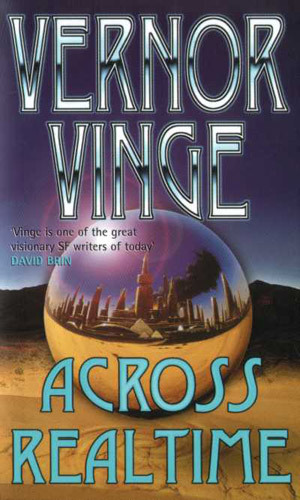 Now, if Vinge would only learn to type a little faster and keep up the quality.